The EXP brings a new level of computer-controlled machine capability to broadhead building. Starting with a tiny, spring tension clip that holds the blade in place when open and closed, and ending with a new idea in stop collars that lets YOU choose from two cutting diameters just by flipping the collar. The EXP is a masterful blend of engineering and technology. 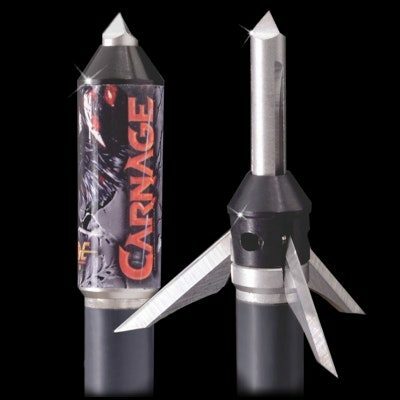 2 blade .030″ blades 1 1/8 and 1 7/16 cut diameters. It wasn’t good enough for us to just have a mechanical head in our line, so we reinvented the mechanical head. The EXP™ brings a new level of computer-controlled machine capability to broadhead building. Starting with a tiny, spring tension clip that holds the blade in place when open and closed, and ending with a new idea in stop collars that lets YOU choose from two cutting diameters just by flipping the collar. The EXP™ is a masterful blend of engineering and technology. 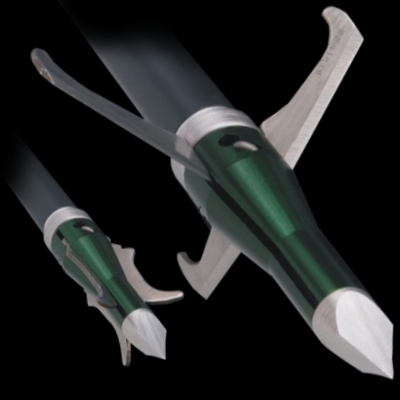 At the heart of the InnerlocEXP® you will find a tiny spring clip that carries out three major functions. It is a pivot point for the blades to rotate (“A”), a clipping point or catch to hold things together (“B”), and finally it provides a small amount of spring tension that interacts with a “cam” on the blades, giving the blades an action much like your pocket knife. (“C”). 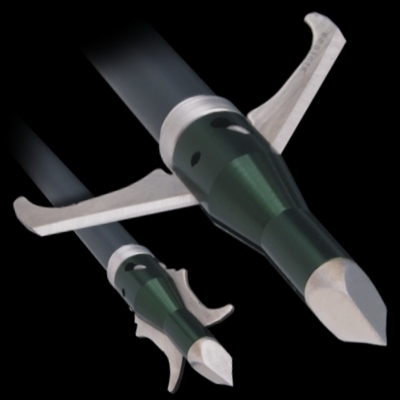 Using the tool supplied push the end of the Cliploc™ pin out through the hole into the blade and out the opposite side of the ferrule. Lift out and discard the old blades in a safe manner (we recommend placing the blades in a container and wrapping with tape). Repeat for all blades. Place new blade in position to make sure blade fits properly and channel in ferrule is clean and free of obstruction. Sharp edge of blade faces inward. 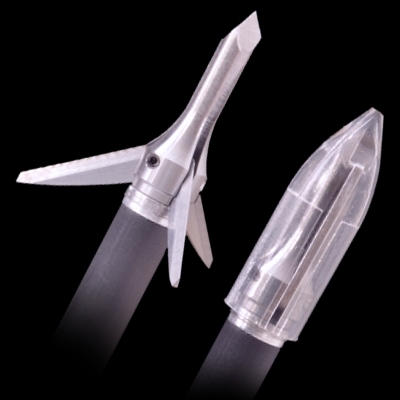 Holding the broadhead as shown, place the longer leg of the Cliploc™ pin into the upper hole which will pass through the hole in the blade. Press gently with your thumb as you “wiggle” the blade. When the hole in the blade aligns with the pin, you will feel the pin “seat”. Using the flat side of the tool, push firmly until the Cliploc™ “snaps” into position. The spring pressure needed to operate the blade will only occur when the Cliploc™ is fully seated in the groove. When properly positioned, the Cliploc™ pin is flush with the surface of the ferrule and fully depressed into the groove as shown. Carefully open the close blade several times to assure smooth operation.